This is my exercise for the muscle on the edge of my hand. Im trying to find ways to improve my classic palm. I do this several times during the day. Ive been doing it for a few weeks and it has made a difference. Next, just put a coin in CP in each hand and go about your business. I found typing to give the most result, but pretty soon they'll be dropping less and less. Definitely agree that walking around the mall etc with a coin in classic palm is a great strategy. Once you're totally comfortable with the coin and can forget about it, you'll be far less likely to give off the "I'm doing something I don't want you to know about" vibe to your spectators. I like to walk around with two coins - one in classic palm and one laying on the fingertips. You can get a lot of practice with a palm to palm change and get that same sort of comfort level needed so that you don't give off subtle indications that you're "doing something." "A lot of practice with a palm to palm exchange." That's great. I usually think in terms of walking around with a coin concealed but not moving it around as if in a performance. Thank you for that idea. For those that think they have weird hands, you should have seen Al Goshman demonstrate his classic palm. The coin would sit waaaaay back, closer to the wrist. He also could vanish around 6 coins or so, one after the other, palming, pinching and clipping. It was a sight. He couldn't really recover them all but that wasn't the point. I can't believe I'm recommending this (even a blind pig finds an acorn once in a while), but Reed McClintock has a DVD Classic Palming With Coins that is quite good. Excellent training ideas, I think. Thanks for that suggestion. Ill look into it. Oddly enough my left palm is fine. Other than just continuing to improve it. It makes things backwards though as Id prefer it was my right hand that it came more easy. Keep in mind that just because you have two hands doesn't mean they both work the same. I know of many magicians that struggle with moves requiring one hand or the other. I found early on that I could classic palm coins, billiard balls, etc. equally well with both hands, but my left is definitely more suited to certain card moves. I can do a one-handed faro shuffle in both, but the LH is much, much better at it. Regarding cards, there are some top names in magic that are right handed but hold the deck in their RH when they deal. Phil Mickelson is actually right handed in everything except his golf swing. He learned standing across from his father who is right handed and he simply "mirrored" the swing, resulting in a LH swing. So my suggestion is to keep trying to improve but know that if one hand is lagging behind, it is perfectly normal. And here I go, resurrecting the dead threads. Maybe I should have chosen "Necromancer" as my screen name? 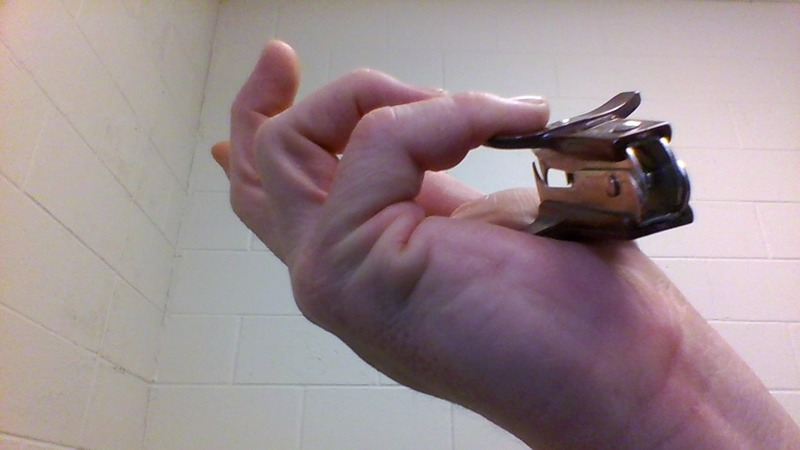 Anyhoo, for the exercise with the staple puller, are you pushing it down with your pinky or what's the motion? If you don't want to sit through it, the basic gist is that getting a good classic palm is sort of like body building. You basically start out by doing a horrible, stiff, crinkled finger version and as you become more accustomed to it, you will be able to relax your fingers more and more until you get a "natural" look. Yeah I am pushing it down with the pinky. I found that it really fries that muscle there. Looking at that picture you can see the crease in that muscle running down the side of my hand.